I am a self proclaimed Janite (ie. Jane Austen fangirl) and that means that I am obligated to at least consider reading any adaptations that get published. 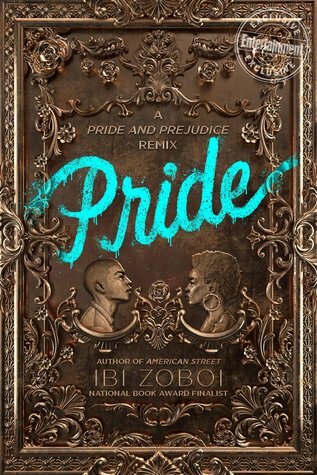 I was thrilled to get a signed copy of Pride by Ibi Zoboi in one of my Owlcrate boxes last year, but it has taken me ages to finally get around to reading it. I grabbed it on the way out the door to a family dinner last week and managed to finish it in a few hours, so I can honestly say that it was an easy read, but maybe that was just because of my familiarity with the source material? Anyway, let’s jump right in! Synopsis: Zuri Benitez has pride for her  Brooklyn neighbourhood, family pride, and pride in her Afro-Latino roots. But pride might not be enough to save her rapidly gentrifying neighborhood from becoming unrecognizable. When the wealthy Darcy family moves in across the street, Zuri wants nothing to do with their two teenage sons, even as her older sister, Janae, starts to fall for the charming Ainsley. She especially can’t stand the judgmental and arrogant Darius. Yet as Zuri and Darius are forced to find common ground, their initial dislike shifts into an unexpected understanding. But with four wild sisters pulling her in different directions, cute boy Warren vying for her attention, and college applications hovering on the horizon, Zuri fights to find her place in Bushwick’s changing landscape, or lose it all. I honestly wish that this book wasn’t so obviously supposed to be a modern retelling of Pride and Prejudice, because then I might have actually enjoyed it more. It was too hard for me to distance myself from the source material and like the book for what it was. It often felt like the author was trying to write a completely different story but was forced to stuff it into a P&P dress with the hopes that fans of the original would read her book. With that said, I felt that Zuri was a completely unlikable character from start to finish. While I understand the pride that she takes in her culture, family, and home, she lacks any of the sweetness of Elizabeth Bennett. While Lizzy was at least willing to give Darcy and Bingley a chance at the beginning, Zuri is immediately outraged by the Darcy boys because their family dared to renovate and move into the dilapidated old house across the street. She is prejudiced against them from the very start and continues to throw the fact that they weren’t born in “the hood” in their faces on a regular basis. Perhaps my own experiences with moving to new cities and neighbourhoods have made me too sensitive to Zuri’s attitude, but I know how hard it can be to move to a place where everyone knows each other and where a tight bond of familiarity seems to keep newcomers out. It is lucky that the other Benetiz girls are so friendly or else no one would ever feel welcome in Bushwick. Sure, Zuri’s younger sisters are all as oblivious as their P&P counterparts, but at least they are willing to reach out to their new neighbours and try to get along. Zuri is 100% anger at all times. I can’t say that it was all bad though. There were some truly good moments to the book when it wasn’t trying to be P&P. I really enjoyed Zuri’s interactions with Madrina, the land-lady/godmother who lived downstairs and was a religious leader for their community. Zuri dancing it out in the middle of a drum circle in the basement is one of the best parts of the book. I also really enjoyed Zuri’s first glimpse of what life at college might be like. These moments are where the true character development happened, and why I think that the author should have just written the real story she wanted to tell, instead of poorly rewriting a well-loved classic. Have you read this book? What did you think? Am I being too sensitive? Is my love for P&P too great to appreciate this properly? I’ve heard really mixed things about this book. Some people absolutely love it, but I’ve heard from a couple people that it’s just not that great. Great review, very insightful. I definitely agree with you — I think this might have been a great story if the author wasn’t trying so hard to shoehorn it into the P&P framework. There were parts I really liked, but overall it didn’t live up to my high hopes.